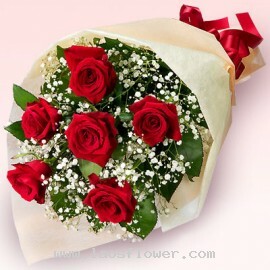 6 roses or a half-dozen roses mean need to be loved and cherished. 6 roses or a half-dozen roses mean need to be loved and cherished, I love you, I miss you - 6 roses are a symbol of passion, obsession - this number is pronounced in Chinese as liu and it means all done easily and smoothly. 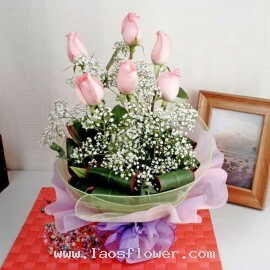 6 orange roses arranged in a glass vase accents with caspia flowers and ferns and tied with pink ribbon. Customers can change the color of the flowers and ribbon on it. Please inform the staffs when ordering or by e-mail. Occasionally, substitutions may be necessary to create your bouquet due to ..
6 pink roses bouquet accent with white gypsophila and leaves. Wrapped with yellow and pink paper. Adorned with a purple bow. The colors of flowers and all material can be changed, please inform the staff when ordering or by e-mail. Occasionally, substitutions may be necessary to create your bouqu..
A bouquet of 6 red roses accent with white gypsophila flowers. Wrapped in cream paper and tied with red ribbon. 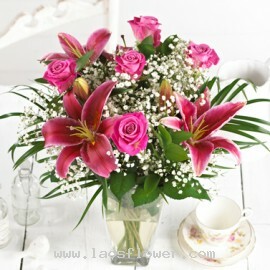 You can send this bouquet with a teddy bear or a box of chocolate. The color of roses, paper, and ribbon, can be changed. 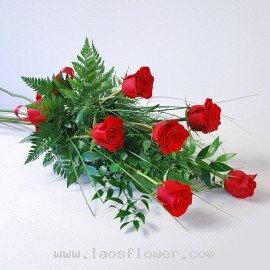 Occasionally, substitutions may be necessary to creat..
A bouquet of 6 red roses arrange as a long bouquet accent with green leaves and tied with red ribbon. The color of roses can be changed such as white, pink, yellow, orange, purple, etc. Occasionally, substitutions may be necessary to create your bouquet due to the availability of certain flowers ..
6 red roses in a clear glass vase and tied with red ribbon. This bouquet arranged to show on 1 side. * The color of roses and ribbon can be changed as you like. Occasionally, substitutions may be necessary to create your bouquet due to the availability of certain flowers in various parts of the c..
6 long-stemmed red roses arranged in a glass vase accents with pink wax flowers or white gypsophila depending on the season. * The color of roses can be changed as you like. Occasionally, substitutions may be necessary to create your bouquet due to the availability of certain flowers in various p..